Home » board games , clue , gore verbinski , movies » No Verbinski, no! Make BIOSHOCK instead! PLEASE! No Verbinski, no! Make BIOSHOCK instead! PLEASE! The last time I heard any news about Gore Verbinski (who helmed the Pirates of the Caribbean movies for Disney), he was gearing up to direct the big-screen adaptation of the video game BioShock. And Universal was said to be wanting it to come out in the summer of 2010. The Hollywood Reporter is breaking the word that Verbinski will be working for Universal all right... but on a feature film version of the board game Clue. I wish to heck that I were making this up. Look, here's the thing: Clue has already been done! It was a movie that came out in December 1985 starring Tim Curry, Christopher Lloyd, Madeline Kahn and Martin Mull (among others). And it was a good movie, as its now-cult status has proven. If you've never had the pleasure, I would definitely recommend getting it via NetFlix or whatever. 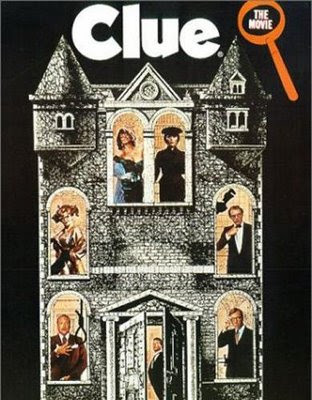 The gimmick of Clue the movie is that they filmed three different endings, so depending on which theater (or which screen at that theater, as some carried more than one version) you went to see it at, there was possibly a whole different outcome of the story. It was a brilliant take on the rules of the classic game. Trust me: this is one movie that doesn't need to be remade. It is well enough on its own, still today. But Hollywood now seems hellbent on exploiting board games as its next "money-making" genre, what with Ridley Scott directing Monopoly, Michael Bay producting Ouija Board and Ethan Cohen writing the script for Candyland (?!?!?). Gore Verbinski, if you ever read this: I'm begging you good sir, please... don't do this. There's nothing wrong with BioShock. That's a movie you were born to direct. Trust me: there's nothing but grief that can possibly come from another Clue. In the name of all that's good and holy, I urge you to reconsider. This just disgusts me. Mr. Verbinski, we plead with you to not move forward with this project. The original was just fine in its own right and DOES NOT need to be re-made for any reason. If people need to be introduced to it, the DVD is widely available! AAAAHHHHHH! That's terrible news! Mr. Verbinski, you MUST do Bioshock. You must! Never mind that I fail to see a viable movie being made out of a board game (Clue was, of course, good). But Monopoly... really? Ouija Board? Please tell me you were kidding about that. Next thing you know, there will be a movie about Chutes and Ladders (the romantic comedy or some such trash). But, even worse would be to be taken off a project as potentially brilliant as Bioshock to be put onto the Clue remake... how insulting. Clue is a classic. I remember seeing it for the firs time on vacation at my aunt's. I love watching it when it comes on. Great cast that does not need to be remade.